I love eating beans. 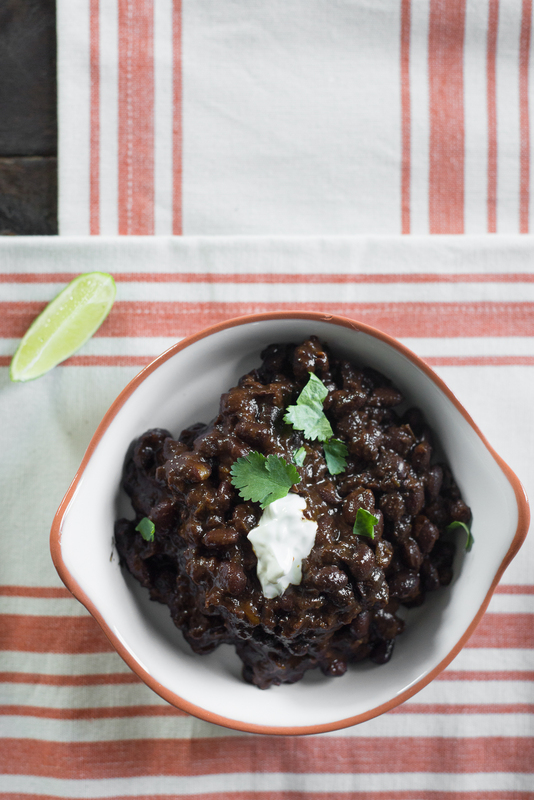 They are easy, versatile and CHEAP (this bean recipe is a bargain at 82 cents a serving!) A good batch of beans in can be placed in a burrito for lunch, atop a salad or in a “Yum Bowl” for dinner, and it even makes a great snack. In my house you will frequently find a batch of beans in the fridge which can serve any of these purposes in a pinch. Although dried beans are economical, I have to admit that until now I relied mostly on canned beans. I generally was not good a planning for the long amount of time to soak and simmer dried beans. However, with my Instant Pot making dried beans is quick and fuss-free. I’m making more beans than ever, which is helping us to eat even more plant-based than before. And my family and I agree the texture of pressure cooked dried beans beats a can of beans any day. With so much available research on the benefits of beans including increased lifespan, decreased blood sugar and cholesterol, finding this new easy way to enjoy beans is a game changer! Place Instant Pot on "Saute." Heat oil and add onion, red pepper and cloves. Saute for about 5 minutes until soft. Add spices and mix thoroughly. Add tomatoes and saute 1 minute. After rinsing beans thoroughly, add water and broth to the pot. Cook on "Manual" for 35 minutes. Do a Quick Release, open lid, turn off, and place back on "Saute". Cook another 5-10 minutes to reduce the liquid. Smash a few of the beans against the bottom of the pot and stir to get a thicker consistency. Omit the salt and crushed red pepper and this is a perfect baby food. For brand new eaters, puree some of the beans with the broth or other soft foods to make a smoother food. More experienced babies may enjoy more texture. Smush a few beans and let them use their new pincer grasp to try to pick them up and feed themselves!